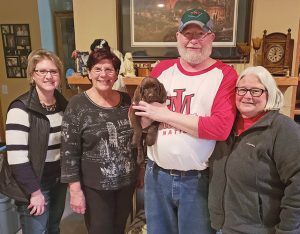 On Feb. 16, 2018, the shelter in Detroit Lakes received two newborn pups whose Springer Spaniel mama had died in labor the night before. The relinquishing family knew they didn’t have the resources to keep the pups alive, so they reached out to the shelter in the hopes that the newborns could be saved. A desperate plea found its way through social media to Springer Rescue. There happened to be a lactating Springer mama in the Rochester area who had given birth just weeks before. A relay-style transport was set for the following day. The dedicated shelter manager named the siblings Chip and Salsa. She worked through the night to bottle-feed the pups, but sadly, Salsa didn’t make it. Chip’s life depended on this transport and the mama waiting 275 miles away. Chip’s tiny transport box consisted of a hot-water-bottle base covered with blankets. One transport volunteer sat in the back seat with Chip, bottle-feeding him while her husband drove. When Chip arrived at the home of his surrogate mama, Keeva, foster mom Maggi Stow rushed him to the whelping pen and introduced her to this desperate little soul. The possibility of Keeva rejecting him was on everyone’s worry list. And then, would he latch on to her? “Prior to his arrival, I put a towel in with Keeva and her puppies to get their scent on it; I thought I’d wrap the little newcomer in it and present him to Keeva. I was very worried because he was so small and weak. So began Chip’s important first weeks of life. During that time, Keeva cleaned him and fed him, and Chip’s new siblings made him one of the pack. “Keeva’s puppies were three weeks older than Chip, so I had to make sure he got his turn at the milk bar,” said Maggi. He ate and grew. And grew. And grew. “I held him for the first time when he was four days old and approximately 10 oz. I looked at Maggi and said ‘I don’t know if he will make it,’” said Wonda. When he was eight weeks old, the Moehnkes adopted Chip and gave him the life every dog should have. This little boy who started life with the odd stacked against him survived and is thriving because of a surrogate mama and foster family who went “all in” for their Chip. Ellington Starks is editor of the Wagazine and volunteer coordinator for English Springer Rescue America.